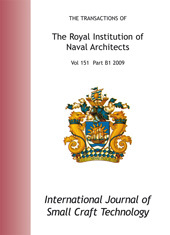 The digital archive editions of the International Journal of Small Craft Technology (IJSCT) are available to member and non-member subscribers. These digital editions can be fully searched online, printed out or annotated with personal notes and bookmarks. The on-line editions, feature advanced page turning technology, multiple views and zoom for easy reading. The issues include live web links to other sites and direct e-mail links. Readers can download, read off-line, print articles and add personal bookmarks and notes to the publications as well as use the advanced keyword search tool. Click on a issue title below to view full digital edition (will open in a new window). Members and non-member subscribers must log on with their Subscription Number or RINA Membership Number (include any leading zero's) to view the issue.